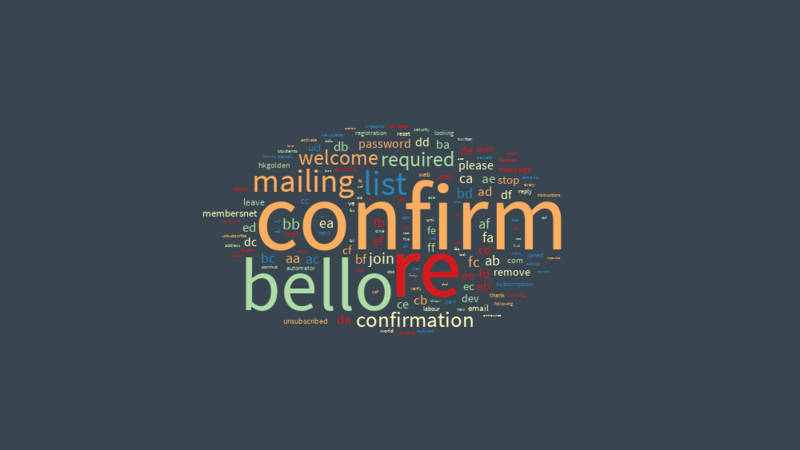 #bellogate - a Breakdown of the Spam. This morning (9th October 2014) was not like any other morning. Usually I wake up and check my nightly email while having my breakfast. This morning, however, I awoke to my work email account having just fewer than 3,000 unread emails waiting for me. During the night someone on the UCL Students email list had worked out how to send an email from the provosts email account to the all students mailing list saying the single word “bello”. What’s unclear was that this email appeared to come from the Provost’s alias and no-one knows if the account was hacked (which would signal a breech of an account) or just some student on campus who knew how to spoof the email headers. No one knows exactly what has happened, and this is only speculation, but what I think has happened is that the general mailing list for all students has been setup incorrectly allowing anyone with the email address to send to any message to the student body. Until an official statement has been announced we won’t know for certain. As of 9:30am the mailing list was closed down and an investigation is underway according to the @uclnews twitter account. @uclisd have done a great job keeping everyone notified even to the point of apologising to all the students via a text message to mitigate any concerns. So what happens when you are researching ways to deal with unstructured textual data, have a toolkit, which collects data from various services and access to all the emails that were sent? Obviously you analyse the data! I quickly wrote some software to pull the data into the Big Data Toolkit and processed the data. I stripped out all identifying details such as email address and analysed only the date, time, subject heading and message body for information on what was being discussed. 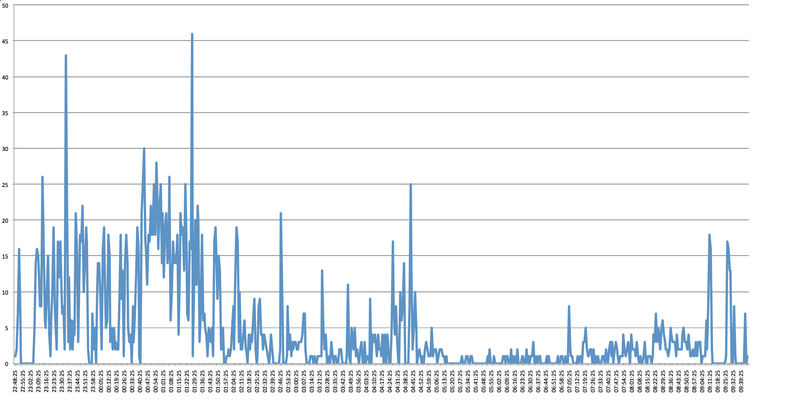 Below is a short breakdown of the data processed by my Big Data Toolkit. 2,968 emails were sent out during the spam attack. Assuming that there is 26,000 students at UCL (from 2012 stats) then the total load on the email servers was 71,168,000 messages sent over a period of 11 hours. A few years back while I was a researcher at the Department od Computing Science, Glasgow University we purchased 2 small Nabaztag rabbits to augment our prototype multimodal navigation system. The rabbit announced instructions for the users to search the map to find different locations around the world – a sort of digital treasure hunt. Fast forward 7 years and I’m doing it again. The Karotz, the new name for the rabbit, is a special interactive device. It has ears that you can position, an LED in it’s belly that you can set to various colours, a microphone so you can give the rabbit commands, a speaker to play music either remotely or from a USB stick which can give the rabbit a voice, a nose to smell out those pesky RFID tags and a new feature that’s different from the older rabbits, a webcam to see. We’ve bought another 2 rabbits for our research at CASA and we’ve been having a think about how we can use them to brighten up the office. For the first few months we had some issues with our corporate WiFi network, think blocked ports and firewalls, so actually getting the rabbit to talk to the outside network has been a challenge. By setting up a 3G router in the office we’ve been able to have more control of our Internet of Things devices and this has meant that we can make these devices respond to some of our collection software. Once we got the rabbit connected, I decided the first thing we had to do was make the Karotz API friendlier to developers. I set up a small web server written in Node.JS on an internal server where we could send commands to the rabbit and it would proxy these authenticated commands to the Karotz API, which in turn sends to the rabbit. These types of ubiquitous technologies allow developers to integrate real time data into our lives without users having to log onto computers or get our mobile phones out to actively check on services. We are just starting to explore the possibilities of this technology so stay tuned for some more of cool little side projects.